Children who are fortunate enough to have a climbing frame swingset or mini roundabout in their gardens have many opportunities for healthy, active play. Since kids need a good bit of activity every day in order to build strong bodies, parents are wise to provide their children with convenient ways to get their daily exercise. Climbing frames and other outdoor activity centres provide children with places to not only have fun, but improve their health, as well. Selecting a climbing frame takes careful consideration. The family budget is often an important factor, especially since outdoor equipment varies greatly in cost. It's important for parents to set realistic limits on spending because once they are out shopping (especially if they bring the children along) adding optional features can make a dramatic difference in the final price.In addition to cost, parents should consider the long term capabilities of the climbing frame, selecting one that will meet not only their family's current needs, but will remain useful for years to come. Some basic centres are designed primarily for young children and do not offer much of a challenge for older kids. Parents must take into account the fact that what entertains their preschoolers may no longer appeal to them once they are school aged. A generation ago, residential garden play centres were mainly constructed of metal and weren't particularly attractive. Modern centres are often crafted of wooden parts, which are sturdier and longer lasting than the older versions. Today's families have many options, many of which are designed to blend seamlessly into even the most natural of gardens. Wooden sets may cost more than their metal framed counterparts, but they are often far more aesthetically pleasing, making them favourites with parents who hope to create a garden atmosphere that is welcoming to adults as well as children. When it comes to the welfare of their children, parents are typically quite cautious. When shopping, parents should choose products that carry a CE and Lion Mark, indicating that they have been manufactured to the highest standards currently in force. The British Toy & Hobby Association (BTHA) sets the standards, helping parents and others who shop for children to choose products that are designed and manufactured with safety in mind. The Lion Mark symbol is also used by approved "Lion Mark Retailers," indicating that all toys sold in their shop meet these high standards. Lead paint is unacceptable; low cost testing kits are widely available to test for the presence of lead paint. All play equipment needs to be secured to the ground so as not to tip during use. Edges should be smooth, with no protruding bolts or unfinished ends. Swing seats should be impact absorbing and swings should be set at a height of at least 200mm to ensure safe ground clearance. Slides should have safety sides of at least 64mm, as well as hand grips at the top of the steps. 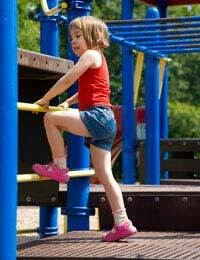 Climbing frames and other outdoor play equipment can provide kids with countless hours of fun. Children have a natural tendency to be active and as long as parents provide them with opportunities to exercise in fun, playful ways, they are likely to build and maintain strong, healthy bodies. Fitness need not be dull or tiresome. In fact, the best ways to help kids to stay fit involves just letting them be kids.